Sometimes I get inspired by the strangest things. I saw the cutest little nutcracker on the pastry bag. 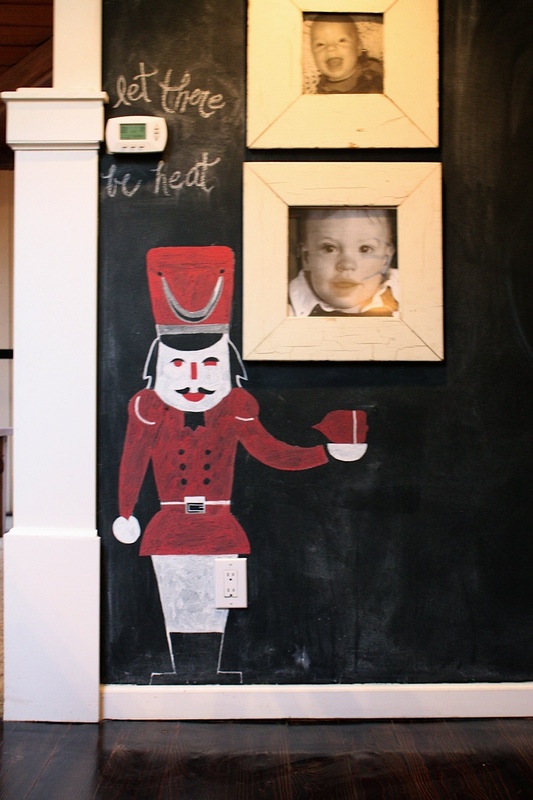 I thought to myself, "that would be so cute enlarged on my chalkboard wall in our kitchen!" So, I set out to buy colored chalk, only to find out the red was more pink on the wall. So then I found at my local craft store, chalk pens in "earthy" hues. I set to work yesterday to re-create this cute little guy on my wall. I enlarged the guy off the bag 700% at my local copy center and then cut out the image, taped it to my wall, and traced around it. Then I filled in all the details. This was the same wall last year around this time. 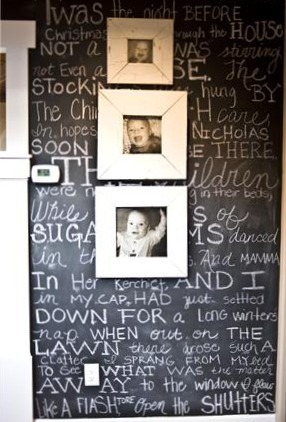 See, chalkboards aren't just for kids! I LOVE this! You did such a great job, and I love the "let there be heat" around the thermostat ha! What a wonderful idea! You did an amazing job on the nutcracker. Too cute! Love the"let there be heat" around the thermostat! Thanks for sharing. What craft store did you find the chalk pens?I've been looking everywhere for some. 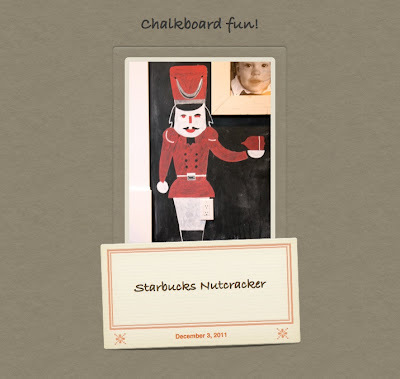 Your nutcracker is so cute! Love that!!! Very cute. I would never have thought to do that. You did a great job filling in the details free-hand too. You should join the copy cat challenge going on at Debbie doos right now through The Picket Fence blog. You can find it on my blog at the bottom of my latest post. yay....you made it a post! I love this chalk board wall! I love it !! i just love chalk boards !! Oh I love chalkboards! Ranch Boy makes barn wood ones and we used one when we cut down our tree and took our Christmas photos today~ I think it's going to turn out super cute!! 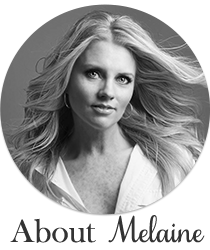 Melanie, this is so adorable. That is what I call thinking outside the box! I am happy you joined in on the holiday copy cat challenge. Isn't chalkboard paint the best! :D Nice copy cat, and it shows that inspiration can be anywhere! Oh, and I am linking from Debbiedoos.